Note: All data referenced was current as of 2 PM CST, 3/9/19, unless otherwise noted. When it comes to Brady Skjei, the devil certainly seems to be in the details. From the high-level overview, Skjei appears to be a defenseman who has done ok with the shot share (Corsi) and scoring chances (Expected Goals) on mediocre to bad Ranger teams. He’s known as a smooth skater that can move the puck forward while also being a player who can play in most situations. He had a stellar first full season at the age of 22, playing most third to second pair minutes with Kevin Klein, but since then has slowed in production and effectiveness. Note: Slavin is shown as a comparable, as they have an 89.2% comparable match on CapFriendly.com for their contracts – both of which were signed at the age of 24 while being arbitration eligible. If we were to stop our analysis here, it wouldn’t be unfair to say that Skjei should return to better form as the Rangers get better around him, and the production will follow in suit. The issue with this, however, is twofold. First, because of that rookie season in 2016-17, expectations around Skjei were (and are) very optimistic, and despite a less productive and effective 2017-18, the Rangers decided to bet big on Skjei with a 6-year, $31.5 million deal in July 2018. The Rangers clearly have high expectations for him too, as he only trailed McDonagh (49 GP) and Pionk (28 GP) in Even-Strength Time On Ice per game last season and leads the team in the same category this season (per HockeyReference). Second, with generally worse results as Skjei’s TOI has risen, it is natural to ask why this is the case, and what the Rangers can or should do to get more value out of Skjei moving forward. In order to understand the current state of Brady Skjei, it is best if we also review the past two years to provide the correct context. Outside of 7 games in 2015-16, Skjei made the Rangers in the fall of 2016 to begin his career. After initial brief stints with Adam Clendening and Dan Girardi, he settled into a third-pair role with Kevin Klein for about 30 games. In the second half, as his point total kept rising, he was used in a higher TOI role with a slew of teammates, eventually settling with Brendan Smith for the playoff run. From a results standpoint, we couldn’t have asked for much more out of the 22 year old, as the Rangers were better with him on the ice than off when it came to shots and scoring chances. Skjei was slated into the 2nd pair to begin 2017-18 with Brendan Smith, as the two looked and performed solid in the previous playoffs. The results didn’t end up being the same, with Smith taking the blunt of the blame, while Skjei eventually fell into a higher TOI role with Kevin Shattenkirk for about 25 or so games. The second half of the season was similar to 2016-17, as the Rangers sold off and he played top-pair minutes with a slew of partners. His production dropped, as the Rangers team defense (beyond just the defenders) was one of the worst in the analytics era (since 2007) in terms of shots and chances against. Overall, his shot and chance results were still slightly above average for the year, possibly indicating that he wasn’t completely out of place with the higher TOI. This is where the positive sentiments mostly stop for Skjei, as 2018-19 has been a challenge. With a thin Left-Hand Defensive corps for NYR, Skjei again has generally seen high TOI, mostly with Adam McQuaid, whose best NHL days are well behind him. His results have been woeful – close to Staal and Pionk levels for both shots and chances for and against. Even with his individual and team on-ice shot percentage above his career average, he is still only on pace for 22 to 23 points this season; a disappointment to say the least. To finish, I’d be remiss to not mention that Tom Urtz Jr. beat me slightly to the punch here, pointing out that Skjei has played better since McQuaid was traded. While it may be expected for his overall shot and chance results to be sub-50 percent due to the Rangers being bad, the fact that Skjei is not making the Rangers overtly better while he’s on the ice (relative results) should be slightly concerning. The key to remember with this season and last is the fact that he’s seeing more than 18 minutes of TOI at even strength, whereas in 2016-17 he was seeing under 16. With higher TOI, players tend to face higher-level opponents (who in turn receive higher TOI themselves), and that is exactly what has happened to Skjei. Could it be that Skjei is struggling with higher TOI against better players? This is a crude and partially subjective way to look at it, but in general the answer seems to be yes to my question posed above. His expected goal rate doesn’t change dramatically, but the shot attempts (Corsi) do. He has tended to help generate much more offense when playing less minutes, which is likely due to playing against lower TOI competition in 2016-17. It’s not particularly shocking: Skjei is certainly an NHL player as his career GAR/WAR chart showed at the top of the article. The question now is can he take the next step to be more than a third or second pair defender? As we’ve seen from his partner history, it may be key for the Rangers to find Skjei a good complement in order to maximize his abilities. As with a lot of the analysis this year, the focus will need to be on the defensive personnel this offseason in order to continue to improve from the depths of the end of the AV era. 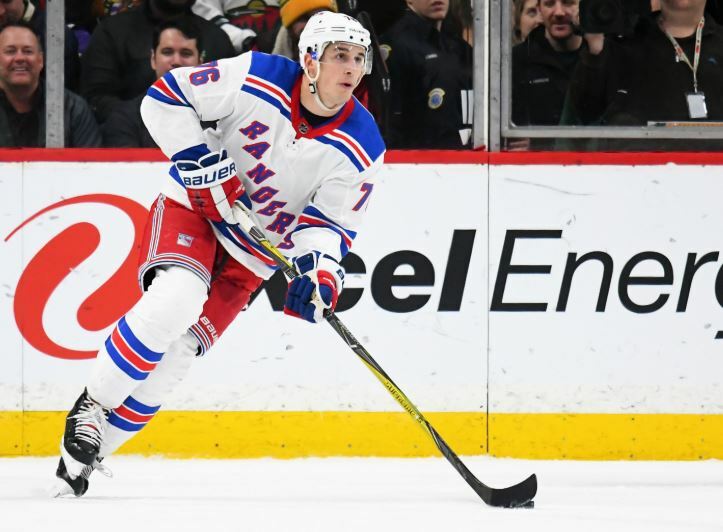 Skjei will likely continue to see high TOI simply because the Rangers don’t have any other options when it comes to Left Handed defensemen, so who to play with him is a mixed bag. Quinn and Ruff for some reason haven’t been willing to give Shattenkirk top minutes, so that now leaves DeAngelo or Smith. Skjei and Smith were reunited in the ugly Detroit game on 3/7, but I do think he is the best option for the remainder of the season because of his ability to defend the zone and play with pace. To end on a positive note: Brady Skjei has certainly shown flashes of being a good modern NHL defenseman. At 24, there should be a little more left to give, but at the same time it is clear he may need a good partner in order to maximize his production and effectiveness. Whether that be Brendan Smith or someone in the future that isn’t in the Rangers organization now, let’s hope we can get more of what we saw in the spring of 2017 in Ottawa, as the group will need it. "Brady Skjei: The Past, Present, and Future", 3 out of 5 based on 4 ratings. I can see Brady being traded in the near future, when the new kids arrive and show their stuff. He has been too inconsistent for him to be considered for the long haul!!!! I have to agree. He may prove to be more valuable in a trade than as another 2nd pair defenseman. he has to turn it around first. what would you trade for a player of Brady’s description today with 5 more years at $5.25M and a 10-team NTC? no, Gorton made his bed and now he has to lie in it on this one. Just looked at the contract, really designed not to be dealt. Light bonus action, (including 1 after NTC kicks in,) not front loaded. Considering they bought 2 years of UFA at that price it’s a good deal, but his game has to get stabilized. In my opinion if they pair Brady with a good partner it will pay dividends and the kid will be alright. I believe in his talents. A: A solid 2nd pair RD paired with him so he will have the green light to jump into the play. B: A solid 2nd pair LD so he can play on his off hand and generate cheap points via one timers. C: To learn how to play shutdown D and let ADA walk it out most of the time. D: A change of scenery. All answers are correct, it’s up to him, the coach & the GM to figure out what the best path is. I believe that paired with a solid RD you will get the best out of Skjei. He has the wheels and the ability to jump into the play on a consistent basis. The tools are all there, it is a matter of bringing out his best. I am optimistic that we will see it happen. With the untimely injury to Libor, and the less than stellar play of the rest of the defenseman, is it finally time to give Gilmour a shot? Couldn’t we sit Stall and Smith and Pionk a few games so the kid sees NHL ice? That ship has sailed. Gilmour is a two time all-star at Hartford who has never gotten a shot. I suspect the Rangers are right, but he has to believe the organization has not given him a fair shot. He is a Rule 6 unrestricted free agent at the end of the season. He is no doubt itching to find a new organization and a call up at this point will be seen as too little too late. I don’t see the downside of calling Gilmour up even if that is the case…the kid can skate and shoot. What is there to lose? You have 3 more call ups available. Why are you wasting one on a guy who isn’t going to sign/Rangers don’t want to sign? For a high event guy at both ends in Hartford? A guy with emergency call up/7dth D upside? A guy who would be after ADA & Shatty for running your PP? Or would you want to get an actual prospect like Sean Day(even though he always seems like he’s in Chateau BowWow) away from a fringe AHLer like Raddysh much like they got Hajek away from ECHL level D men. Or even Crawley. Fine. Love to see Sean Day too rather than reading about his potential for years and years….. If I recall correctly, they haven’t even tendered a contract to him, or so it’s been written. If that’s an indication of what the organization thinks of him!!! It isn’t about tendering a contract. Gilmour is 25, has three professional seasons and will have fewer than 80 NHL games. He is entitled to unrestricted free agency as a Group 6 free agent. For all practical purposes, he is no longer Ranger property. So were Boo & Fogarty, yet they were extended. Nice analysis. It doesn’t look like Skjei is bad, more than he just hasn’t been good – really just average. But actually, only half the story is given here. I know that offense is good defense, but what about his shot suppression stats? All of your plots are offensive. Can you speak on his defensive work? I can’t post any graphs in the comments, however if you sort by Corsi Against per 60 (or any of the against categories), you can see that Skjei is pretty much down the middle in most. He’s not letting as much against as other less defensive names (Girardi/Staal/Pionk/DeAngelo) but he’s also not as shutdown, so to speak, as a player like Claesson or Klein. The second graph of the article (comparable to Slavin) also shows DEF (defensive) metrics as well when it comes to xG (expected goals) and Corsi. With the bars going down, this indicates he’s below average/close to average for a defender across the league, which essentially checks out against the NST figures in the link. He’s kind of just a high-event player – a lot for and against when he’s on the ice. Hope this helps explain. Thanks! I really need to start bookmarking those sites. He’s clearly worse than Slavin, which is sad, though CAR has had pretty good metrics for the past couple years, unlike NYR. And an you say, he’s not really so much bad, just kinda not awesome. He’ll almost certainly be a serviceable 2nd pair guy. Still, here’s to hoping Quinn can bring out his potential to be the next McD. Libor Hajek: I want to just say back in the time frame of Sept/October Adam Herman stated how unimpressed and bad Hajek will be and rated Hajek way down on his Ranger top prospect list….where is Adam now on Hajek?, the managers of this blog give that guy too much reference and credit on here. What do I know thou, have close relations with personal in the NHL presently and former strength conditioning coaches in the NHL, in the off-season, skate with former players and all, talk to people at the rink, but what do I know, I like to know writers background who post such strong opinions, analysis, and forecast on young players because sometimes it sure seems per the content one is stating, shows they have no experience within the game. AZgene… Does the FO believe Rykov has similar talent to Hajek? I know Lindgren may be rated below Hayek, but I’m wondering about Rykov’s talent level. They thought Bereglazov had potential, took a week of rookie camp & 4 games at TC to know he didn’t. Once the zone is gained(given up) the NHL & KHL are pretty different games. Not nearly as much skating in the KHL, way more conservative. With all his skills it’s just a matter of him not trying to do too much and playing with the right partner. In a perfect world he would best be utilized in a 2nd pairing. Listen, even McD looked shabby at times over the course of his last year or two here in NY prior to his trade to TB. It’s a little early to dump him but I would certainly listen to offers despite the fact that he’s definitely looked better of late. I don’t always agree with your posts, but I think you are spot on with this one. Skjei ‘s metrics are not miserable. I believe he really is trying to do too much also, as he’s skating with a bunch of AHL quality defensemen (other than ADA). Brady skates very well, has good size and I think he’ll get better as we get better players around him. I’m not panicking about Brady… I really think there’s room for a great deal of improvement. All year long we heard how bad our defense is – Skjei is a part of that issue. He also seems to be the only tradable commodity we have in the backline. We have probably 2 kids who can break into the lineup next year. I would use Skjei as an asset during the draft. If someone asks about him and we can move up a round or two, I think we should do it. Agreed – start fresh with new kids. Can they be much worse than Pionk, Shatty and Skjei on the backline? You have to stagger your contracts out: both with the 23 & 50 man rosters. Skjei is on a semi-friendly contract, hits his prime right after expansion. The idea is to have a corps that can hit the ground running in 2021, ditching Skjei without a significant upgrade doesn’t do that. If you can deal him for RFA Trouba(basically WPG gets cost certainty at a lesser $) that’s worth taking a risk. Agreed … I would swap him for for Trouba in a heart beat — depending on the additional asset(s) required of course. Skjei is an LD that was sheltered by McDonagh for his first 2 seasons. McDonagh played against the Ovechkins and Crosby’s of the league for 25 minutes a night while Skjei didn’t have to. Now he is the top dog of a bad defense and is feeling the effects. If they improve the personnel around him then his numbers will increase. Unfortunately I don’t see Skjei as a “best defender on the team” kind of player. And if he is then that team is as bad as this team is right now. And that isn’t a bad thing. On a contending team he is a fine 2nd line defenseman.